Not a whole lot of people out there really need this little doodad, but for a few this is just gonna be great. Riders out there with road frames older than the year 2000 probably have downtube shifter bosses. 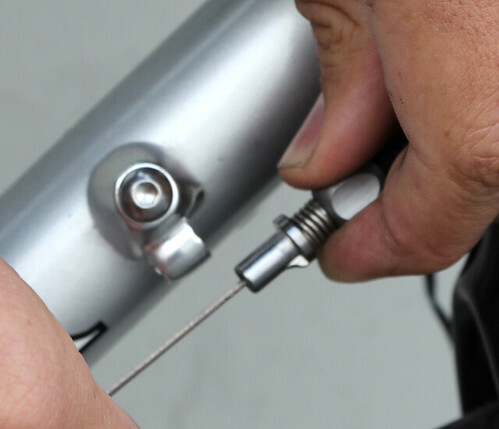 If those riders are also using an integrated brake/shift lever or bar end shifters, they probably have some sort of downtube adapter to act as a cable stop. Functionally that’s fine unless by chance you also have S&S couplings on the bike. 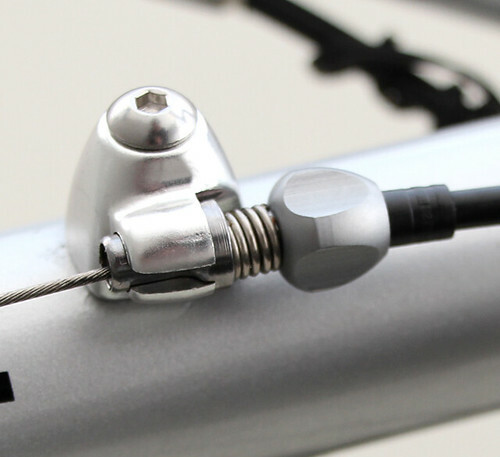 I find the need to unscrew the adapter from the frame to be a pretty annoying step, but IRD’s Quick Release Downtube Cable Stop basically turns your shifter boss into a split stop while still incorporating a barrel adjuster. $27 retail might seem a little expensive, but I’ve tried to make something like this myself…..so I know these little bits are waaaaaaay better than anything I can fashion. Nothing earth-shattering, just a small way to improve the ergonomics and serviceability of your bike, courtesy of Interloc Racing Design. I’m going to buy a few sets just to have on hand when the frameshop does S&S retrofits on older bikes.